Our service plans are customized to address the current or potential pest concerns at your home or business. 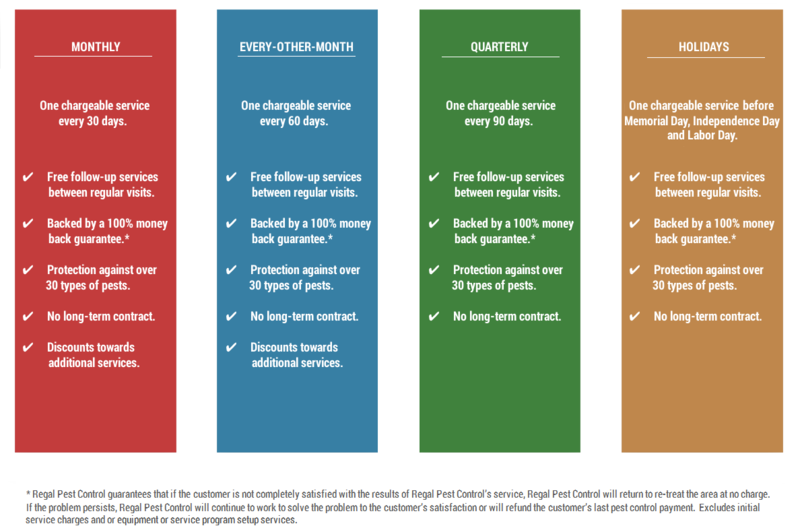 There are several factors we use when recommending service plans to our customers. The main consideration we ask our customers to make is their threshold for pest activity. If you, the members of your family or the employees at your business are allergic to bees or other pest bites, your threshold for what would be considered a pest issue is much lower and the importance in addressing those pest issues increases considerably, compared to a customer who does not have that concern. Further, certain pest droppings (rodents, wildlife) can cause adverse health conditions to all of the occupants in a home or business, especially if the location becomes overrun with that particular pest and it’s droppings. The other factors we ask our customers to consider have to do with the environment surrounding the home or business. Is the home on a wooded lot? Is the home on or near a lake or pond? What is the condition of the building or of the building materials on the home or business? We will look for gaps and other areas where pests can enter and point those areas out to the customer. Our technicians will take into account the customer’s concerns and several other factors when we recommend a service interval. We will walk you through these considerations, step-by-step, to assist you in choosing the service plan that is right for you. Interior applications may not be necessary to provide effective control for certain pest issues. Our technicians incorporate an Integrated Pest Management approach (commonly referred to as I.P.M.) when conducting services. By utilizing our existing knowledge of pest biology (life cycles, habits, ect.) and by identifying existing areas that may contribute to pest activity, such as food or water sources and entry-points, services can be conducted in an environmentally sensitive approach. For continuous protection from a variety of pests, we offer monthly, every-other-month, quarterly and holiday-only maintenance programs. Our pest control professionals can explain the benefits of our different service programs and can customize a program based on your pest control needs. All of our maintenance programs feature free follow-up services between regular visits, are backed by a 100% money back guarantee*, provide protection against over 30 types of pests, have no long-term contracts and offer an unparalleled level of customer service and support. Monthly and every-other-month customer programs even offer discounts towards additional services (see our customer referral program for additional details). There are several factors that are used to determine which maintenance program service interval is right for your home. Our technicians will thoroughly explain the benefits of each program based on the variety of factors that can contribute to pest activity at your location. For pest issues that require perimeter applications, we typically use micro-encapsulated products. These types of products have several benefits when controlling insect pests. The micro-capsules extend the life of the product (providing your home with long-term protection against pests), they stick to the surface they’re applied to (delivering a fast knock-down of the pest and providing more stability with the placement of the product) and are virtually odorless. Many of the micro-encapsulated products we use are labeled for over 30 types of insect pests. They can also be used on porous and non-porous surfaces without staining. When applied in the interior of the home or business, these products are used along baseboards and perimeter areas where many pests commonly crawl. On the exterior, they are applied around several key entry-points to provide effective control of pests on the outside while keeping pests from coming in. Some pest issues may require multiple service visits, however we can solve many issues without the commitment of a long-term contract. By constantly reviewing newly available products and by utilizing the most advanced products available to us, we can often reduce the number of service visits necessary to address many of the pest concerns at your home or business. Ants, Bed Bugs, Bees, Beetles, Bird Control, Boxelder Bugs, Cockroaches, Crickets, Drain Flies, Earwigs, Fleas, Flies, Fruit Flies, Gnats, House Centipedes, Indian Meal Moths, Mice, Millipedes, Mites, Mosquitoes, Moths, Rats, Silverfish, Sowbugs, Spiders, Springtails, Stink Bugs, Termite/Pest Inspections, Ticks, Wasps, Weevils, Wildlife and many other pest issues.